You can have RadGrid automatically sort its columns by setting the AllowSorting property to True. When sorting is enabled, arrow buttons appear on the column headers that allow users to select a sorting mode for each column. 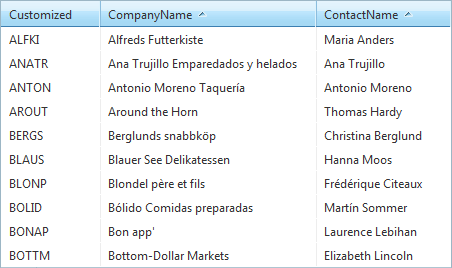 You can configure the grid to allow sorting by more than one DataField (called multi-column sorting). The sorting of the grid is based on the .NET sorting algorithms and the default type value comparators. Since the string comparator depends on the current culture, you could modify the sorting and orderign data by changing it. Additional information could be found at the following MSDN help articles: Comparing and Sorting Data for a Specific Culture CultureInfo.DefaultThreadCurrentUICulture Property Please note that this will affect other formatting in your page, like decimal separators, month names and etc. by setting SortingSettings -> EnableSkinSortStyles to true (default value) which will automatically apply sort color for the corresponding embedded grid skins. by setting the SortingSettings.SortedBackColor property on the RadGrid control, or the SortedBackColor property on a particular grid column (GridColumn object). Setting SortedBackColor on a particular column overrides the setting of the SortingSettings.SortedBackColor property of the entire grid.